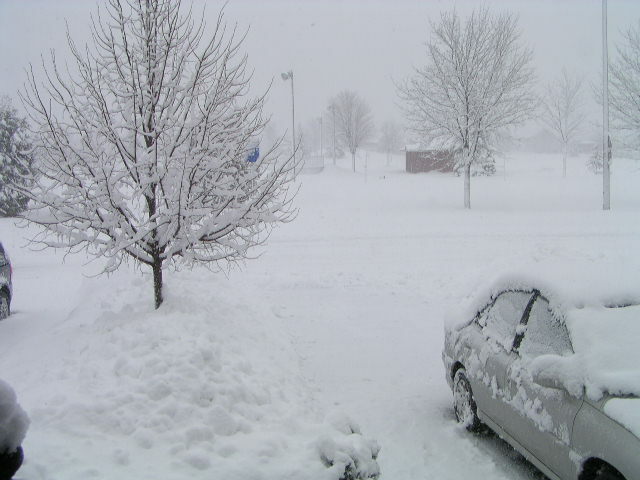 Winter in Ottawa, Canada typically starts towards the end of October and lasts until late April. Yes, six full months of wet, freezing, slushy, snowy, cold weather. 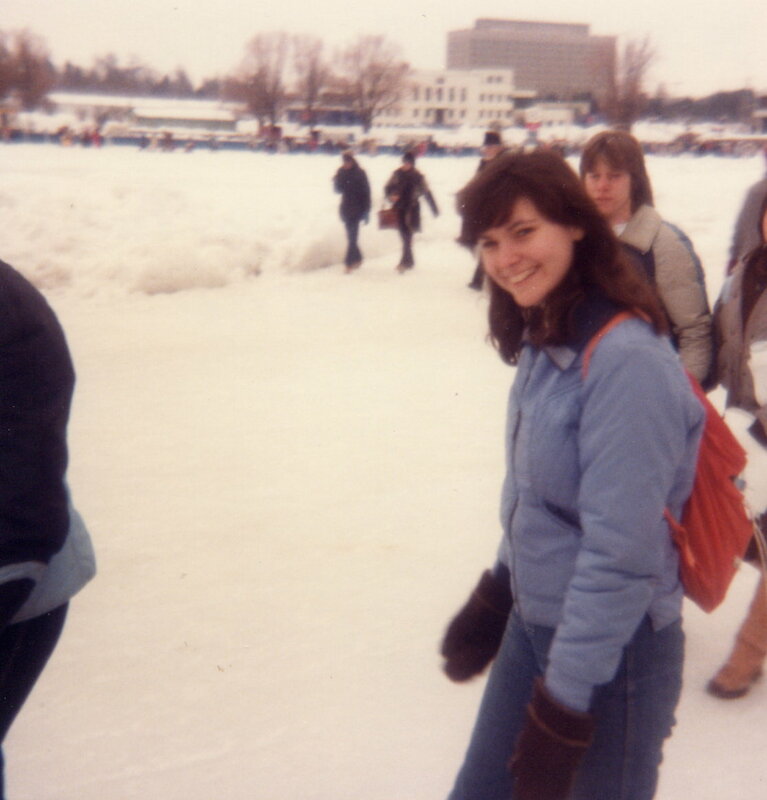 Ruth on the Rideau Canal during Ottawa's Winterlude festival. Dow's Lake, Ottawa, Ontario, Canada. It must have been a mild day. Nobody is wearing a touque in that picture. Often, it rains during Ottawa's Winterlude! I remember back in the early 1970's when I was in public school, and I would listen to other kids who had adventures during school breaks. Christmas break, and March break, many students, teachers, and their families would be off to Florida or some other warm spot for a week of warmth and fun. I was always disappointed that our parents never took us south during the winter. Ruth's parents never did with her family either. 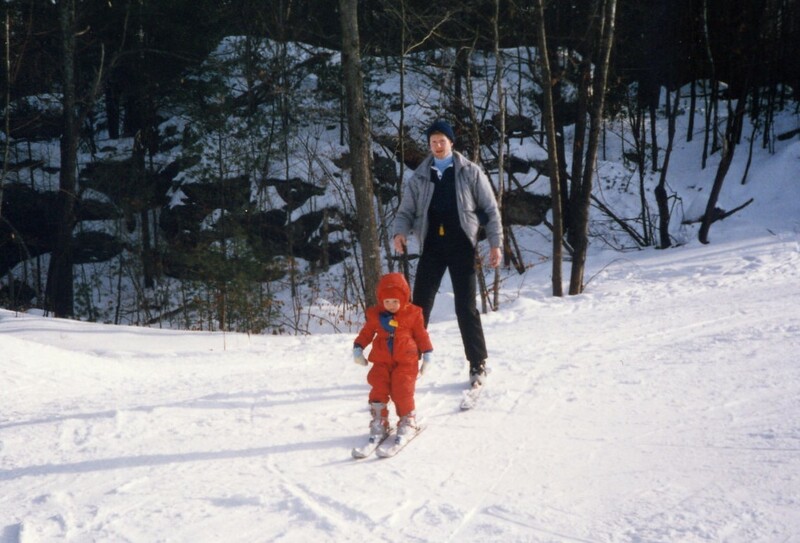 Kevin, teaching our daughter Lindsey (age 2 1/2) how to ski. Lindsey went on to be a very good skier. Better than Ruth or I. She even got her level one instructor certificate. If you're going to be in Canada during the winter, you had better like some kind of winter sport. We're not hockey fans (we are strange Canadians) but we did like going skiing. Toronto airport January 17, 1993. That was the date that Ruth and I finally made it south in the middle of winter. We did a one week all inclusive trip to the Caribbean island of Antigua. We had spent 31 years of life without ever leaving Canada in winter. Well let me tell you, 31 years in a row of winter in Canada was enough! So besides the fact that we already had the travel bug, now we also had the urge to get out of Canada during the winter. After that Antigua trip, we didn't go every year but we did manage three trips to Dominican Republic, one to Cuba, and our first trip to Mexico in 2003. Looking out the front porch of our house after a fresh snowfall. Looks kind of pretty, doesn't it? Yes. Well that's the thing. Winter can be kind of pretty, and we don't mind it in short spurts. Like taking a two week holiday to a snowy winter destination would be kind of fun. No problem with that at all, provided we can spend the rest of the time somewhere decently warm. It doesn't even have to be tropical warm...just so long as it's not snow and freezing cold. So we've been at the point for the last several years where our number one goal in life is to never spend another winter in Canada. This coming winter, we're going to be back in Ottawa three times! October for three weeks (which can have decent weather if we're lucky), Christmas for two weeks (which could be ice cold, or it could be just above freezing) and probably next April for a couple of days, but that's not written in stone yet. We will treat our Christmas visit as a two week vacation! I keep coming across these oddball items available for sale at Amazon. Check this one out, and read some of the comments! I seemed to have found your site by clicking on an information site for 'Boondocking' for RV's! At any rate, I'm another Canadian, recently retired and looking on which direction to head in within this life we live. Our thoughts are to perhaps rent out the house and buy a larger RV and spend some time in the southern reaches where it's warmer in the winter, and then head back here to B.C. during the summer months...although that's all hearsay as we haven't jumped into this new lifestyle as of yet. As our lives lessen, one day at a time though, I'm finding the itch to get out and enjoy the open road and the thousands and thousands of unseen places before any health related issues pop up! They already have for my wife, so we need to get going on this soon I must say. At any rate, for us, the number one goal in life is - get out and enjoy, before you're too old to regret not doing so! The last line of your comment is actually why we are doing what we are doing! Just before changing our lifestyle from an living in an actual house to living in an RV we and heard too many stories of people waiting to retire only to have their dreams shattered because of bad health or even worse, death either just before retiring or just after. We figured we would just take this giant leap of faith and do it. When we are too old to travel, then we will sit in front of a TV knowing that at least we got to live our dream. I hope that you will live the life you want and that you get to get out there and travel! :-) Thank you for taking the time to comment. We too spent too many cold winters in Canada so being fulltime allows us to seek out warmer winter climate and have been doing so for most of the last 10 years, perfect. Keep enjoying the warm temps and travels. Yep, that's the way to do it, just follow that summer time weather! The last two winters have been snowless in the greater Vancouver area. This global warming thing I guess. But the winters seem to get worse in the Maritimes... We're of the same opinion, avoiding a cold winter is a good thing. Ha, great minds think alike! I endured 32 brutal Michigan winters before moving to Arizona 22 years ago. Now, snow is such a rare novelty I actually get excited every time I see it. I am with you. My few days in Alberta in December to see the kids is enough winter, I can't even call our Vancouver Island mild months winter as we see mostly rain and some sun. Very rarely a snowflake. I don't miss the brutal temperatures at all. A few days or a couple of week we can handle, especially knowing that it is by choice! Yes, being on Vancouver Island does make the winters milder but you also don't get to see the sun a whole lot during that time, still better heading somewhere brighter and warmer during the winter. You are getting closer to that goal yourself. Canada is gorgeous! Actually May through to mid and sometimes late October is a good time to visit Canada unless you like winter sports. 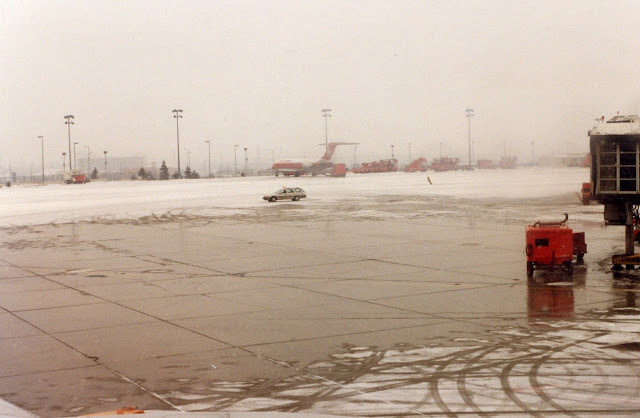 I grew up in Niagara Falls NY -- talk about cold, snowy winters. I left home at age 17 for sunny Southern California and never looked back! Now, many years later, seeing your winter pictures doesn't make me feel one whit cooler. It is a pretty danged hot summer! Yep, you would have had weather similar to us. I don't blame you for moving to California and living there if you get too hot then just head a few hours up to higher ground and you will start feeling cooler right away. I was unimpressed by the Inflatable Toast but pleased to see "in stock" Unicorn Meat and a Yodeling Pickle. Early Christmas shopping! Sorry you were unimpressed with the Inflatable Toast, maybe it was just missing some good jam on it! I think to endure the winters, (hello from Winter-peg!!) you have to embrace it and find the right mind set. Having said that, this past winter I spent at least four hours outdoors every single day, regardless of temperature, and that's what got me through - being outdoors. There is a certain quite and serenity to winter that I truly enjoy. I would love to one day take a winter camping trip! But it's totally not for everyone - I'm a rare breed, ha ha! I grew up outside of Ottawa and and spent my winters skiing at Calabogie, so I do miss having that as a winter activity. I agree with you Janis and when our kids were younger we did lots of outdoor activities in the winter, just to help it pass. When we had Whiskey, she got a good long walk every day of winter, as long as you are dressed for it, it didn't seem so bad. Have to be honest though, it was not fun having to pile on all the warm clothes to go out and shovel the drive way at some ungodly hour in the morning, brush snow off the car, heat the car up, scrap the crap off the windows and then fight in the traffic in order to get to work, hopefully on time. We have skied at Calabogie as well. It's not too far from where I grew up in Galetta, which is near Arnprior. I grew up in Perth and Almonte. We drove the back roads to Calabogie almost every weekend in winter... and I would get motions sickness almost every time! I grew up in Galetta, so not too far from Almonte. We took our kids to Pakenham for their first year or two of ski lessons. It is a small hill so a great one for learning on. We went to Calabogie a few times but really preferred the hills in Quebec better. So refreshing! But come on, winter isn't that bad here. Still, +30 is better than -30, especially if you have some shade to retreat to. It's not so bad if we choose to enjoy it for a couple of weeks on our own terms but to have to endure the whole winter is just too much for us now. Yes, we will happily take +30C any day even with the humidity.